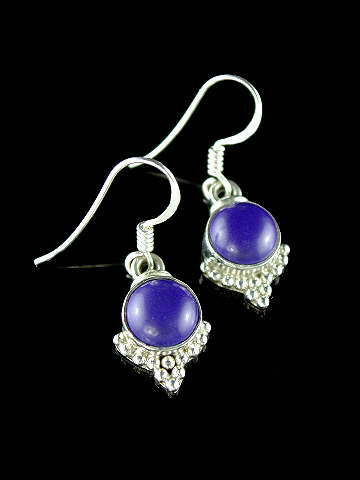 Simple but beautiful Balinese design Lapis Lazuli cabochon drop earrings in 925 sterling silver. These have a slightly deeper, royal blue colour in 'the flesh'. Lapis Lazuli is one of the best intuitive stones. It opens the Third Eye or Brow chakra when used or worn, can facilitate spiritual journeying and generally stimulates your spiritual energy. Its Pyrite inclusions make it a protective stone; which shields and then returns negative or harmful energies safely back to their source. Lapis also increases bonds in friendship and love, making it an ideal token of your affection for a loved one.